Lean in and look a little closer—there’s more to these pieces than meets the eye. Water-repellent trousers that actually look good, flannel-lined pants that feel like pajamas, 2-in-1 reversible tops, plus fabrics that stretch as you move. These clothes might sound too good to be true, but they’re for real. Whatever life (or the weather) throws your way, these hard-working pieces have you covered. Check out our picks and see what all the hype is about this fall. We’re not talking about your typical rain coat here. Stitch Fix exclusive brand Hawker Rye has designed a pair of slim-fit chinos with water-repellent technology to keep you dry during your commute on rainy days. 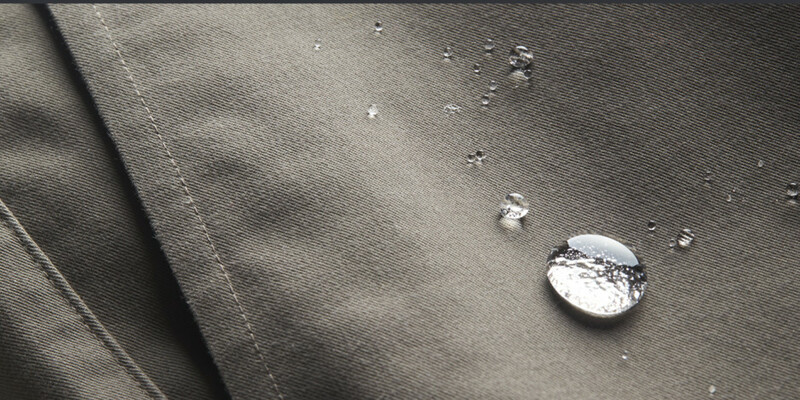 Water actually beads on the surface and rolls right off instead of soaking into the fabric. Need to step out for lunch? No problem. Have evening plans? Easy—you’re still nice and dry. You’ll want these miracle chinos and other water-repellent pieces, like nylon joggers, a sleek rain jacket and a hooded anorak to take on the season’s wet weather. Cooler temps might have you wanting to stay inside and curl up on the couch, but with the right layers, you can stay warm for all of fall’s outdoor activities—from football in the park to afternoon hikes. We know how much men like flannel, so Stitch Fix exclusive brand Alesbury designed flannel-lined pants that feel like pajamas but look like casual everyday wear. Save the Duck’s packable puffer jacket even uses PLUMBTECH® insulation, a thermal padding technology that replaces down feathers and is better at trapping heat. Cozy fleece pullovers, flannel shirts and blanket-lined jackets are more no-brainers for warmth and will keep you comfortable on crisp fall days. Why wear a regular shirt when you could sport a 2-for-1 instead? This fall, we’re seeing pieces the can be flipped for an easy outfit change. That’s right, reversible clothes are no longer just for kids. From knits to pullovers, these versatile two-way tops give you the flexibility to swap looks whether you’re packing light for a trip or just interested in stretching your wardrobe. Consider your fall shopping done. A little elastic goes a long way. The new wave of stretch fabrics have a small percentage of Spandex or Lycra to move effortlessly with your body. On the outside, they look just like regular fabrics, but with their two- and four-way stretch design, you won’t ever have to worry about rips or tears. From casual shirts and flannels to blazers, dress pants and button-ups, these pieces will keep you comfortable all day long. Trivia moment: A “knoven” is a half-knit, half-woven shirt, where the sleeves and back are made of stretch knit and the rest is like a regular woven button-up. Try that one on for size. Ready to impress your friends? Schedule a Fix and request these conversation-worthy performance pieces.